This one-day course is specifically written for the holiday maker for whom a short holiday does not justify a complete language course. It comes on one 75-minute CD and teaches only basic, core words, as few as the holiday maker can get away with, and a few useful phrases, which will be supported by body language. It comes with an 8-page booklet which simply lists the words and phrases taught on the recording - no pronunciation guide, no grammar summary, just a written record of what has been learned. The action takes place during a flight from London to Italy. 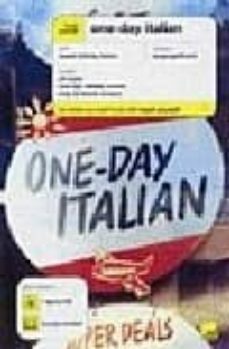 Following a challenge from the passenger in the next seat to her, Elisabeth Smith teaches him enough Italian to be able to get around on his holiday. The dialogue is broken up by in-flight announcements, meals and drinks being served and even some turbulence. The course is fast and light-hearted and reflects the anticipation and excitement of going on holiday.